True confession time? The one place where I cannot control my shopping impulses is at Equine Affaire. I'm quite good at restraining myself at a shopping mall. I can even dodge sales, telling myself that I really don't need whatever Macy's is proclaiming as the "must have" item for spring. But at Equine Affaire? I feel like a kid on a toy shopping spree at FAO Schwartz. I'm simply overwhelmed by the beauty of it all. I'm mesmerized by all the horsey-themed gifts, the incredible artwork, the crafty things that scream, "Welcome to a Home Occupied by a Horse Lover!" 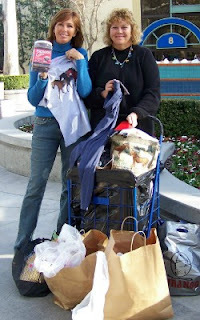 As you can see by this photo of my sister and me, we both (*cough*) bought a few things. I couldn't resist a pair of boots-- hey, they were $30. below retail, and trust me, I know retail boot prices!-- and I got a cute and comfy t-shirt, a cap, a jar of incredibly delicious horse cookies (or so Wally and Lexi tell me), and a pair of western spurs. I couldn't tell you what all my sister, Jill, bought, because she always out-shops me. I can't keep up with her. Some of the things I won't buy at Equine Affaire or any other horse expo? The latest incarnation of a bit. Any gizmo that promises to train my horse to the highest levels of _______________ (fill in the blank). Any miracle cure that promises to be a cure for anything and everything that can afflict a horse. I mean, really. Just one scoop of Wonder Tonic and everything from bowed tendon to navicular to Crazy Mare Syndrome evaporates? Uh-huh. Super expensive bright shiny gaudy horse jewelry. Any super expensive shiny jewelry comes from my husband. It's in our marriage contract. Otherwise, I can pretty much be swayed to buy any product that makes my life with horses easier... especially if it's marked below retail. If you'd like to see what other shoppers nabbed at Equine Affaire last week, click on this link: Cindy Stalks Shoppers at Equine Affaire. I had a lot of fun taking a peek inside the bags of other horse lovers at the grand expo. And if you'd like to share any great buys you've scored at a horse expo-- or if you have any other comments-- please share them by clicking on "comments" below or emailing me at: hc-editor@bowtieinc.com. Once, at the Carolina Horse Expo, I bought ten saddle pads for $10. (We're talking saddle pads for $1 each!) And seven years later... every single pad is still intact. And they're the kind that I use everyday. I've also nabbed custom full chaps for $40. I bought a cooler for Teddy, my old Thoroughbred, for $5, and it fit him perfectly. I can't handle myself at horse stores. I go all crazy. Haha. Alas, the state 4-H tack swap(part of the MN horse expo, it's a HUGE tack swap for everyone) I always manage to come away with more then I need. Though last year I must admit I did pretty well. I came off with a complete western show outfit(besides the hat) for $55:$10, re-read that $10! !, for the chaps, and $45 for the shirt. The year before I put together my English outfit(minus boots) for about $30: $15 for breeches,10 for rat catcher, and $5 for the coat. I've bought bits for as little as $2, and leather show halters for $10, and that's just the tip of the barrel! It's a little like Christmas going to the tack swap... Make that a lot, the crowds come in the same variety(rude,shoving, etc.) deals can be amazing, and there that air of excitement throughout the whole thing, plus without the annoying non-horse related gifts!